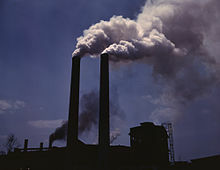 President Barack Obama is reportedly considering a tax on carbon emissions to help cut the U.S. budget deficit. As many know, I am leery of the use of higher taxes in this country and countries like France in the midst of this economic crisis. However, this is one tax that I have long favored — not as a method of deficit reduction but as an effort to force companies to internalize some of the costs of pollution. The key, however, is to allow companies to reduce such taxes by reducing their emissions, creating an incentive to decrease pollution. The Germans have a comprehensive system for imposing such costs on manufacturers. For example, Germany reduces garbage dramatically by forcing companies to pay for some of the ultimate disposal costs of packaging. In the United States, manufacturers use over-sized boxes and containers as well as large amounts of plastics to improve the appearance of products. This material is simply discarded and fills our dumps and landfills. In Germany and other countries, such packaging is taxed to reflect the ultimate costs to society. This has resulted in far less waste in packaging in Europe where companies tend to be equally creative but more careful in the use of material. The proposed tax would start at $20 a metric ton of carbon dioxide equivalent and rise at about 6 percent a year. I would like to see a more tailored approach for companies that focuses on the cost of their externalities rather than simply taxing as a method to reduce the deficit. The current problem with cap-and-trade is that “brokers” are flush with credits and the price is falling to buy the right to pollute. Nevertheless, many have argued for a cap-and-trade on greenhouse gases. If done correctly, a carbon tax could offer a direct incentive to adopt greater methods of emissions reductions. Rather than rely on solely command-and-control systems which specify things like scrubbers, companies could find creative ways to reduce such emissions and avoid the tax. The military usually rank low in political planning** but in mil contingencies they are up there as they should be. Ahh bases, let me recite the names…..! And at the top of the list of those who know what’s going on are the fossil-fuel companies with their unprecedented profits and unbearably overpaid executives and shareholders. (Dealing With Oil-Qaeda). The military are being hit just like the rest of us by Oil-Qaeda. Problem for the military is that these terrorists are their bosses. Should read intermediate comments, would have saved the verbiage. But I can confirm that these are solid companies and it is quite well-researched, cable developed and would take, I believe, less that 5 years to cutove of first phase. Cable drawing included. You are right. As Sweden is a base for ASEA which merged to become ASEA Brown Bovery (ABB), LARGE power people, the proposal was noted in the Swedish newspapers. It was feasible then and more feasible now, due to advances I won’t take up. The project was planned to provide el power to Europe, but coulld meet the needs of the whole of Africa. It was based on photovoltaic cells driven by solar radiation, conversion to Estreme High Voltage to reduce losses over large distances, and cable under the Med. I’d appreciate hearing on anything more modern on it. The stoppers of course are two; big oil opposition and their control of our foreign policy. YES!!!!!!! Thank you. I looked through some of my Discover magazines that are laying around but didn’t see the article. I think it’s a marvelous plan. The US wouldn’t even have the problem of transmitting the energy via undersea cable. You saved me an internet search. Thank you again. You’re thinking of the Desertec project perhaps? The project is actually underway, how large it really gets is still a little uncertain. ID707: “The Middle East? they have lots of desert. I recall reading a few months ago that a plan to put about a bazillion solar panels in a North African desert and send, via cable, the energy generated back to somewhere in Europe (maybe Germany) had moved beyond the planning stage. It was going to take about 15 years but transform the relevant country into the cleanest energy country in Europe and the Americas. I don’t know how ‘clean’ Iceland is, it satisfies much of it’s needs with geothermal, I can’t vouch for the claim. I really don’t recall where I read that, someplace like Discover magazine. I’l try to find it online and post a link. (I should have saved it!) It seemed to me at the time that this was a big step into the future and I was glad some country was doing it. I’ll look for the article. Take my vague recollection for what it’s worth. I’m with Roger, a plan with a date certain to remake our energy landscape could employ millions and rebuild a large segment of our manufacturing base. Cut the defense budget by 75%, declare war on wasteful energy and tell the Islamists that they need to chill, we want out of their countries and resources and plan on being a non-presence shortly. I see win, win, win. Can we do it? I saw a president say we would have a man on the moon in ten years and it happened. The face of education was changed to produce mor engineers and technical workers as an added benefit and it kick-started our entry into the tech age. Good times. And real leadership at a time when leadership was needed. Gen Alexander Haig who helped Nixon decide to depart had been studying at college on just the subject of the milirary’s role in the political process!! He was Chief of Staff after Halderman had departed, disgraced. We have a form of VAT. As long as something is sold, each transaction adds 25 percent in VAT to the price, even services. Sure jacks up prices and cost of living. The Middle East? they have lots of desert. Give them the tech and a percent and they will be satisfied. After all, their culture is pre-oil in its roots. An eye our destimy is another talent that you have. Now is a time for war on carbon burning. Until renewable sources for specialized use the renewable sources can be tolerated. The first big brand full-electric car was announced yesterday, 5 years ahead of what the pundits said. Let’s cover large portions of the SW (for reduncance) and cable the world with EHV supplied by ABB converters and cablage. Then even the rest can get off the carbon tech. No reasons for carbon wars, and an end of oil running our foreign policy. MikeS, I join hours too late, but it might be good to note that cap and trade has not worked effectively in Europe. Too many loopholes. Straigt regulation and stimulous to energy effectivaation and clean stack gas has done a lot however. There is another way this could prove beneficial, in addition to the carbon tax scheme, or anything better. Scientists are studying up on the skills required to properly convey an unpleasant but necessary message to the public. They are concerned with informing the public without angering them or unduly alarming them, as those scientists reveal the dangers civilization faces in the wake of our damaged global climate system (Scientists Seek Strategy to Convey Seriousness of Sea-Level Rise). That mission is not an easy task when people along the coast are told that their land is slowly going the way of the fabled Atlantis which sunk below the sea. The scientists might point out that Atlantis went in an instant, without the kinds of warnings we have today, good and useful warnings to prepare to move and revolutionize history with the change necessary to kick the fossil fuel habit. (Advance To The High Ground). The House GOP deniers are the logjam. The Pentagon was warned on Friday to stand guard against “climate surprises” which could throw off its efforts to secure America’s future. An expert report, prepared for the intelligence community by the National Academy of Sciences, warns that the security establishment is going to have start planning for natural disasters, sea-level rise, drought, epidemics and the other consequences of climate change. The Pentagon already ranks climate change as a national security threat, putting US troops in danger around the world and adding fuel to existing conflicts. More than 30 US bases are threatened by sea level rise. It has also identified potential new danger zones, such as sub-Saharan Africa. The military is also working to cut back on its fuel costs in an age of budget austerity, by installing solar arrays and wind turbines, and monitoring electricity use. But Friday’s report suggests strategic planners are going to have make sweeping adjustments to their planning to take account of climate change over the next decade and beyond. (US Military Warned). Unless the Republicans get a clue I expect them to lose 50 House seats in the 2014 election. My research indicates that the military is far ahead of the civilian denier congress on this issue, as I have stated for several years now. blouise17, A value added tax is somewhat like a tax on a tax, and that may be down the road. However, I don’t think Americans would abide a VAT. Well, maybe Californians.